This is a guest post by Alexandra Karoun Eurdolian. This brought a smile to my afternoon. Took a coffee break in the East Lounge where I was struck by a beautiful watercolor that I had not seen before. 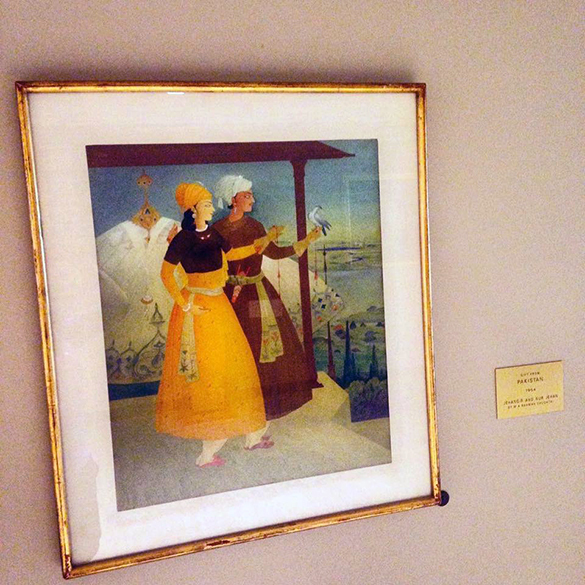 The plaque next to the painting indicated that it was a gift from Pakistan (1954), and was painted by an artist who shared the same last name as my friend Alia. A quick message to her and I learned that they are indeed related, her grandmother’s cousin. What are the chances? She shared a few family memories about his life. According to Abdul Rahman Chughtai’s wiki page, he was “the first significant modern Muslim artist from South Asia.” I was happy to discover his work today. Love the serendipitous, randomness of life sometimes. This is a guest post by Claes Karlsson. 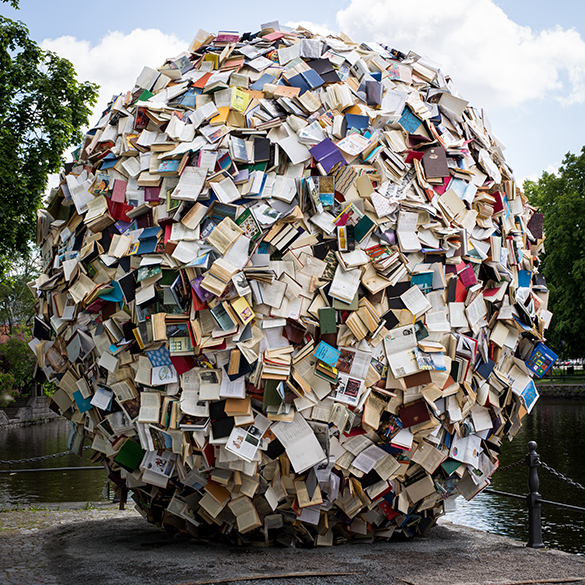 A huge ball of books? That’s what I stumbled upon on my way to work a few weeks ago! “Conciencia” (Awareness), by Spanish artist Alicia Martin, is without a doubt one of the most popular items at this year’s OpenArt in Örebro. It evokes curiosity in old and young. People gather around and examine it minutely. The pages rustle and turn in the wind. Once close, I can smell that familiar scent of – ah, yes – the library stacks. Google tells me that Alicia has attached thousands of books to a sturdy metal-core covered in chain-link fencing. 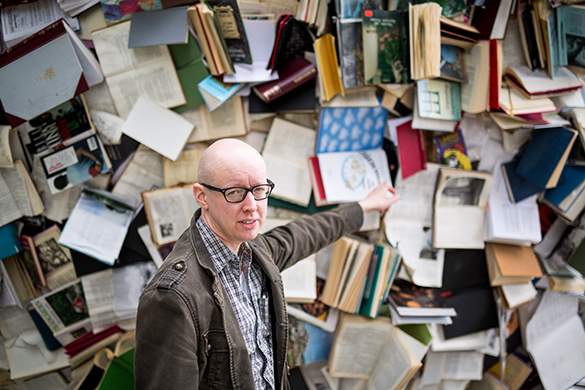 Most of the books have been donated by the people of Örebro and the City Library (Örebro Stadsbibliotek). How clever! Alicia’s work also helps me remember the libraries of my childhood. 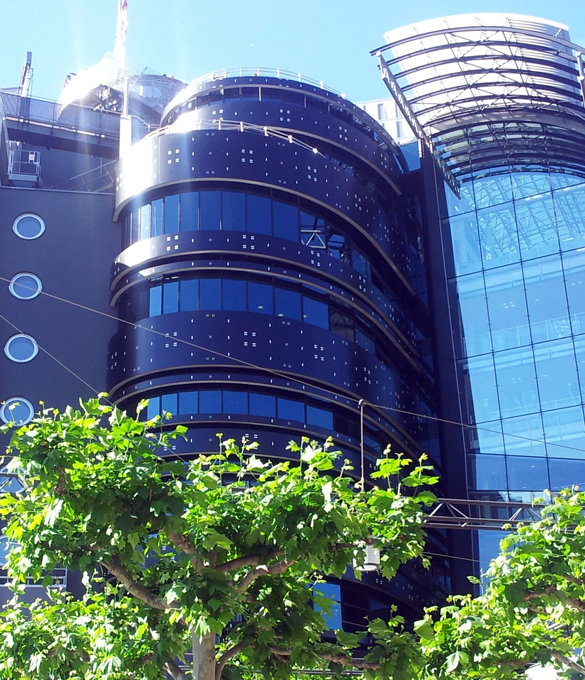 Big buildings, tons of books and an incredible information retrieval system based of cards made of paper! Libraries today, on the contrary, contain both physical books and electronic resources, of which the latter continue to expand on the former’s expense. Maybe one day the physical book will be no more. Of course I wouldn’t dare saying that to my patron (fearing to burn in some kind of library hell! ), but we actually survived moving from clay tablets and parchment rolls to the codex and the book. While the book as a medium can be described as a simple conveyor of beautiful stuff (stories and knowledge, fiction and facts), I can’t help but thinking that the physical book really is a fantastic thing. No need to charge it. No need to update. No constant flow of notifications popping up, fragmenting the reading experience. Virtually no risk of hardware or software failure – just keep it away from fire! Adding to that, easy and efficient organization of bookmarks as well as an integrated seamless note-taking system by using another great invention – the pen. Surely an artifact that well designed won’t give in easily! Or maybe I’m just old. Books and e-books aside, Alicia Martin’s “Conciencia” is my favorite piece of OpenArt 2015. Go see it. It’s brilliant. This is a guest post by Angela Onikepe, who previously has talked about Square peg Frankfurt. The Musée Barbier-Mueller sits discreetly on a quiet street just right after you scale the steps leading into the heart of Geneva’s Old Town. When you enter the museum, there is a muted and intimate atmosphere that envelopes you as you step into a world of classical and tribal antiquities. What particularly drew my interest was their collection of African masks; who’s to say, but I think I was looking for some remnants of home or some glimpse into the past of my native Nigeria. And, I was not disappointed. It was the pieces from the ancient Yorùbáland (which spanned what is today Nigeria, Togo and Benin) that spoke to me in a language I understood. 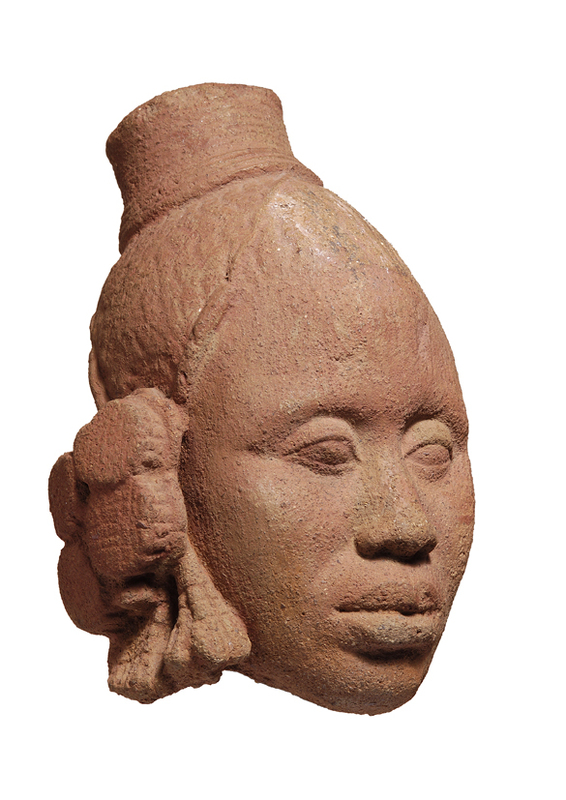 There was the 14th/15th century headdress from the Kingdom of Ifẹ̀ (Ilé Ifẹ̀ in Yorùbá), made of terra cotta, which exudes a regal essence befitting the elements on the mask identified with royal Yorùbá lineages. Headdress, Ilé Ifẹ̀, Nigeria, 14th-15th century. © Musée Barbier-Mueller, Photo Studio Ferrazzini Bouchet. In African culture, masks always served a tangible purpose and were deeply ingrained into the functional life of Africans. They were not decorations. Although their role was fundamentally religious, their roles also spanned several spheres in society, from social to familial, religious and educational and not to mention, their use also for entertainment purposes, social control and rites of passage. In sum, they were integral parts of the traditional society. Of course, each African country with its myriad cultures, expresses this element in its own unique way but the one common thread that binds all African masks is the fact that the mask itself, despite its real-life functionality, was meant to represent something that is, for all intents and purpose absent; a higher reality that is not readily accessible. The mask, in turn, becomes a symbol, rendered into a concrete and sensible form. You can sense this robustness in history with Musée Barbier-Mueller’s collections of African masks. Indeed, this feeling emanates from all the collections in museum. The museum hums; almost as if you are placing your hand on a beating core as you encounter each item. But back to my quest to brush and nuzzle against my people’s past. 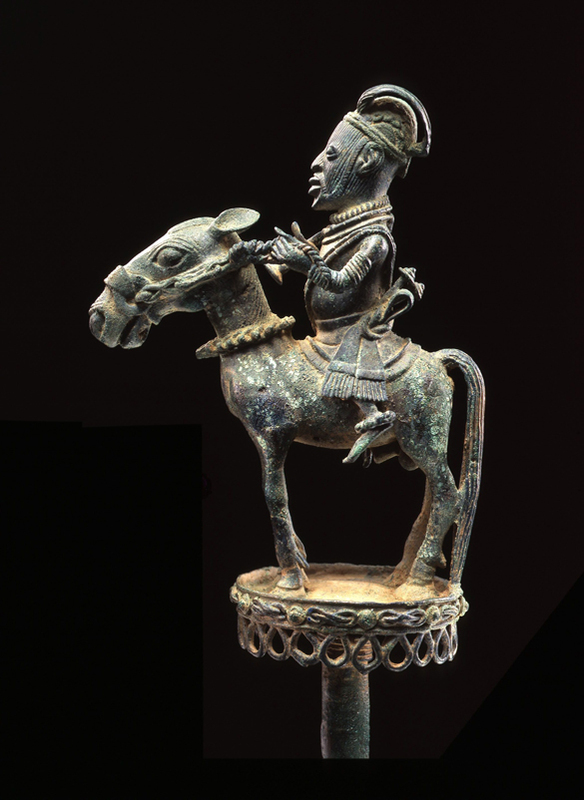 Sceptre with a Horseman, from Ilé Ifẹ̀, Nigeria, 12th-13th century. © Musée Barbier-Mueller, Photo Studio Ferrazzini Bouchet. I did step away from “home plate”, so to speak, to see the other West African masks in the collection. One of the first masks that caught my eye was actually the Kanaga facial mask from the Dogon in Mali. 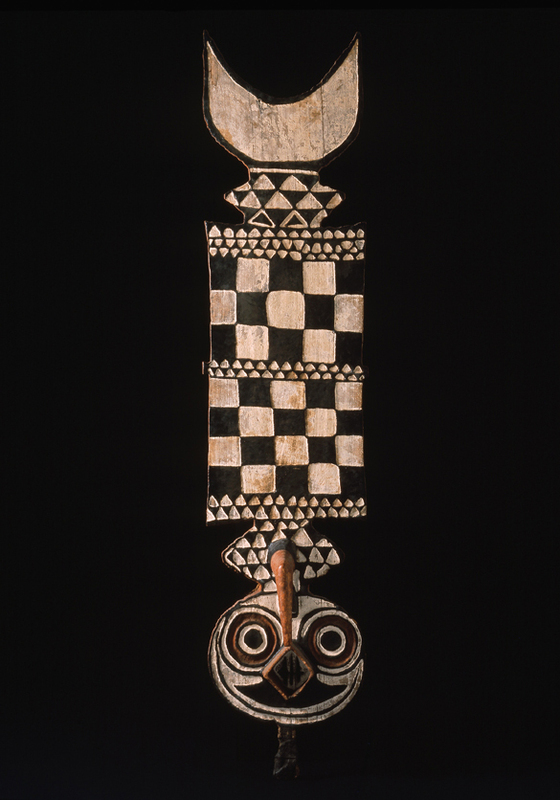 Kanaga masks are the most well-known from the Dogon people and usually represent a bird known as the Kommolo Tebu. The masks owe their existence to a legendary and mythical hunter, who after subduing a Kommolo Tebu, fashioned a mask in its likeness. You cannot deny the majestic stance of a Kanaga mask; it demands attention. Kanaga Facial mask, Dogon, Mali, 14th-15th century. © Musée Barbier-Mueller, Photo Studio Ferrazzini Bouchet. 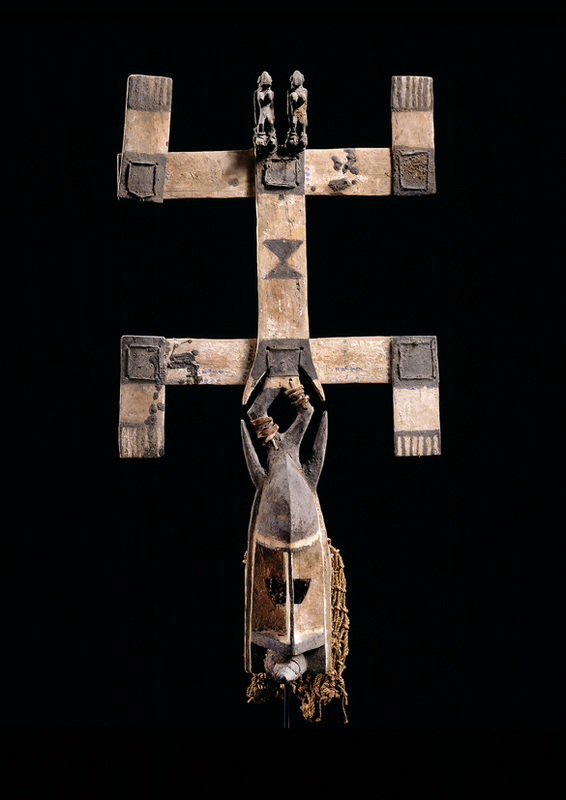 The Grand Masque from the Bwa in Burkina Faso, essentially made of leaves, feathers and plant fibers and meant to serve as a connection to the world of spirits, was not something that could be ignored. Grand Masque from the Bwa (also known as the Bobo Oulé), Burkina Faso. © Musée Barbier-Mueller, Photo Studio Ferrazzini Bouchet. I went to Musée Barbier-Mueller looking for the African connection; not only can you do the same, but your experience can also expand beyond my part of the neighbourhood to other parts of the world and pretty soon, after seeing the museum’s collections, you will find yourself humming right along with it. The Barbier-Mueller collection did not start with its Yoruba “Mona Lisa.” The beginnings of its collection are rooted in the 1920s when Josef Mueller, at first interested in European art, moved to Paris and eventually started working with art dealers specializing in non-Western art. Mueller was so inspired, that he would go to flea markets with large empty suitcases, embarking on new adventures and new discoveries. Anne-Joëlle Nardin, the Deputy Director in charge of communication, explains the history behind the museum, mentioning the passion that fuelled Mueller’s sojourns. Years later, Mueller’s daughter Monique, would marry Jean-Paul Barbier who was also an avid collector. Upon Mueller’s death in 1977, the Barbier and Mueller collections were merged into the private 7,000-item collection that exists today. But the collection expands beyond Africa and Oceania; there are also objects from the East Indies and Greece, to name a few. Jean Paul Barbier-Mueller is, as Josef Mueller was, impassioned by the beauty of these pieces of history and a desire is to give the public access to them. The museum’s exhibitions change twice a year. A new collection will be unveiled on October 17 where you can “Discover the Baga from Guinea.” See you there! This is a guest post by Angela Onikepe. So let’s talk about beauty. What is it? Straight lines? Symmetry? Perfectly round circles? Something that matches the societal standard of beauty? I think beauty is more a case of square pegs. The fact that square pegs never fit into round holes (as the saying goes) or any other shape for that matter, is what makes them beautiful. Square pegs give us the image of messiness, disorder and chaos but that’s the fun of it. The same can be said for life and what is all around us. Take the city of Frankfurt for instance. It’s the financial capital of Germany and although it is quite well known, it does not necessarily get the same courtesy as some of its sister cities. Berlin is always described as “dynamic”, “cosmopolitan” and “exciting”. Munich gets even better treatment since it’s known as being the most “beautiful” and “green” German city. Dresden is known as the “Florence at the Elbe.” How can you beat being Florence? Call me superficial but the term “financial center” does not exactly make you daydream or think of a city with personality. It certainly does not make you want to go and immediately buy a ticket to see what it’s all about. Being known as the “financial center” does not elicit thoughts of idyllic settings and relaxation (okay, maybe some of you are more imaginative than I am). Even so, on a recent visit, I found Frankfurt to be full of square pegs; I had the sensation of slowly unwrapping a present with each peek getting better and better. It was an explosion and fusion of shapes; all sorts of mixtures of lines, patterns and styles that made me positively giddy. Circles mashed in with squares and squiggly lines; spirals twirling around with straight lines and odd-shaped holes. The combination of the old and the new, which to some might seem messy (read → ugly), was seamless. 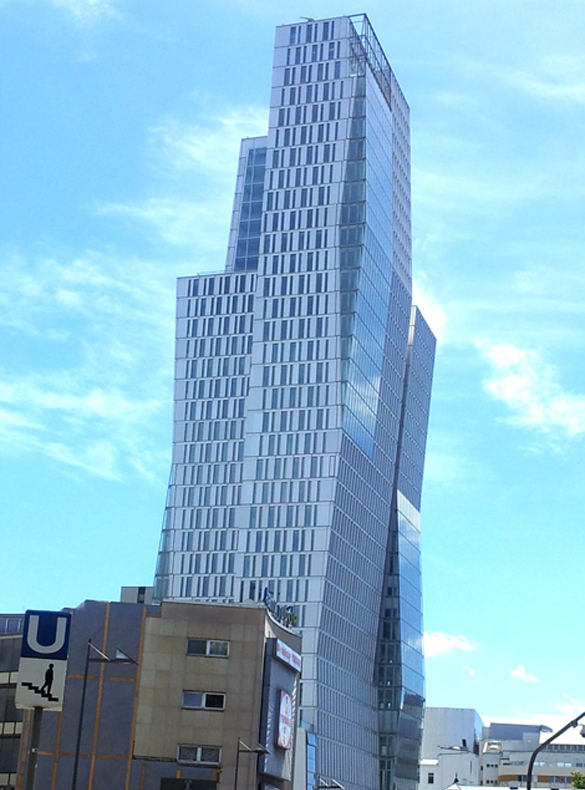 Downtown Frankfurt, the Nextower building. The Römerberg is the centre of the Altstadt (the old town). Love padlocks. 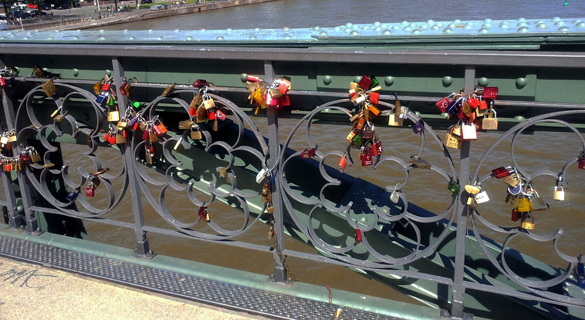 Couples come to the Eiserner Steg Bridge to profess their everlasting love by fastening locks with their names onto the bridge. There was a whimsical feeling to the city, almost as if it was reminding me of what it means to be human – a disastrous but yet fascinating mix of all kinds of things. Now, that’s my kind of beauty in an idyllic setting, a place that reminds me not to take myself too seriously; there’s nothing more beautiful or freeing than that.